Will be available with two diesel and one petrol engine option. If the bulk of traditional SUVs don’t tickle your taste buds and you want something that’s a bit more dapper, BMW have had the X6 on offer in India for a while. But if you don’t have the kind of budget, the Munich-based car maker has now introduced the X4 in India too. Locally produced in Chennai, the X4 is now on sale in three variants - xDrive20d at Rs 60.60 lakh, the xDrive30d with a sticker price of Rs 65.90 lakh and xDrive30i petrol at Rs 63.50 lakh. All prices ex-showroom. In terms of design, it’s hard to mistake the X4 for anything else but a BMW. Derived from the X3’s design cues, this SUV-Coupe gets the latest bolder version of BMW’s kidney grille and those signature headlamps on either side. The bumper looks sporty with large air dams and piano black accents. All three engine options of the X4 will come with the M Sport X package – that has been introduced in India for the first time. From the back, the X4 resembles the larger X6 with the sleek wraparound taillights and the dual exhaust tips. 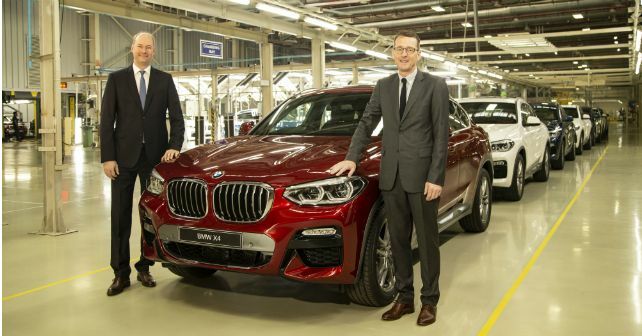 BMW has introduced the X4 with three engine options. The most affordable of the lot is the 2.0-litre diesel as seen on the xDrive20d trim. This is the same engine that also does duty on a lot of other BMW offerings. Producing 188bhp and 400Nm, does the 0-100km/h dash in 8 seconds. BMW has also brought in the 2.0-litre petrol motor that – same as the one on some other models like the 3GT, 5 Series and the 6GT. Here too, the output figures are identical – 248bhp and 350Nm. The top-of-the-line variant is the xDrive30d that is powered by a 3.0-litre six-cylinder diesel that develops 265bhp and an insane 620Nm. Thanks to these figures, the X4 with this motor crosses the 100km/h mark in just 6 seconds. With regards to features, the X4 comes with adaptive LED headlamps, BMW Display Key with touch control, panoramic sunroof, ambient lighting and more. On the inside it has been fitted with a 3-zone climate control, front sports seats, reversing camera and an infotainment system with navigation and Apple CarPlay. The base 20d variant comes plonked with a 6.5-inch infotainment while the other two trims flaunt a larger 10.25-inch display with better resolution. Similarly, the 30i and 30d trims also come with a 12.3-inch screen for the instrumentation. Other features include an M Sport steering wheel, leather upholstery, wireless charging, electronic release for the rear backrest and more. This is the first of BMW launches for 2019. The company has a huge line-up coming to India this year including the new 3 Series, the 8 Series Coupe, the Z4 and more.